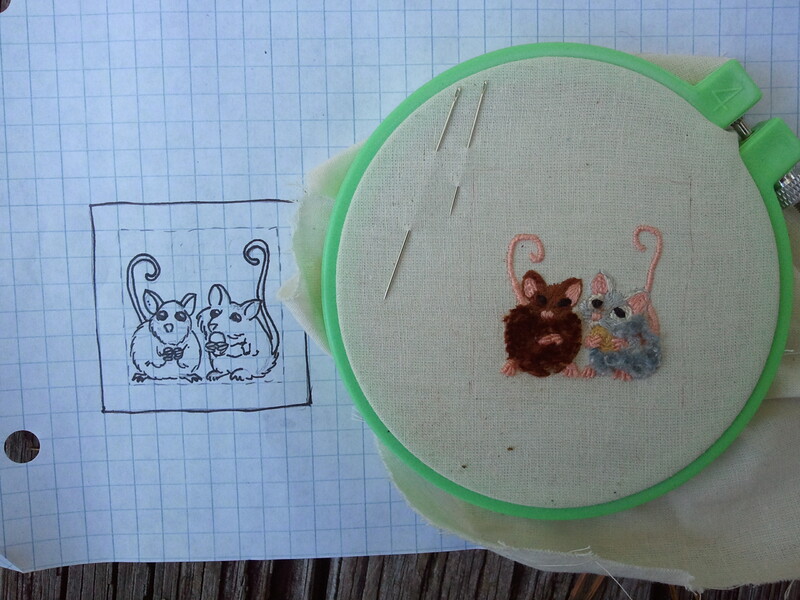 So I had a vision for these little mice I started working on some time back. I thought I’d make their faces in split stitch and use Turkey stitch for their bodies for extra! fluffy! cuteness! In my head, it was adorable. But even though the embroidery communicated the lines of the drawing, it lost something for me. After looking at it for a while, I think I know what it is and what I’d do differently next time. The problem is that the split stitch faces (done with one and two stands of DMC floss) are so flat, and the Turkey stitch is so fluffy, the faces and the bodies almost seem to occupy different planes (in a wrong way.) Instead of the faces pointing out, they recede behind the bodies. It makes them look like they’re ducking their chins into the collars of fur coats. I don’t like it. Possible fixes: Do the whole think in split stitch, which I think worked very well on the faces, and save the Turkey stitch for something else. Or: use a more raised stitch for the faces– split stitch with 4 strands, maybe, or stem stitch. Something that would elevate the face above the fluff of the Turkey stitch. The good thing is, now I know. I plan on using Turkey stitch for a squirrel tail in the near future, and now I have some ideas about how I’m going to treat the body. I also know that I really like bullion stitch mouse toes. Chalk this one up to a learning experience. If I ever want to embroider Cruella DeVille, I know exactly how I’ll I’ll work her coat. This entry was posted in Uncategorized and tagged box tops, embroidery, mice, surface embroidery, Turkey work by Rene. Bookmark the permalink. How about a felt layer under the faces to bring them forward. A technique used in stumpwork. Here’s an example from Elizabeth Braun. I also used it when I made my owl. http://inlovewiththreads.wordpress.com/2012/03/19/look-what-i-won/ I just used a layer of felt for the bird’s body and then another smaller layer over it for the face. Could work for your mice. Thank you for both those links. That’s a great idea, and would definitely help with the sunken faces problem. I love that owl. The texture on both the owl and the tree is wonderful. Thanks. I love texture and am working on a couple of pieces now that have lots of it. I will keep an eye out. I love the way you worked the tree branches the owl was sitting on. Thanks again. I’m constantly working on how to get more of it! He is sort of blobby. Probably his revenge for getting left out on the cheese-holding front. If I try again, he’ll either be holding something or have his body at an angle, like the gray one. And a stumpwork face! Raising the faces would work, I think. I recently had a disaster with Turkey stitch too. Worked great in head, in reality, not so much. I will say though, that I’m a bit in love with the Turkey stitch on the gray mouse. There’s a lovely subtlety in the shading and shine, mimicking fur nicely. Thank you. Turkey stitch can be finicky! 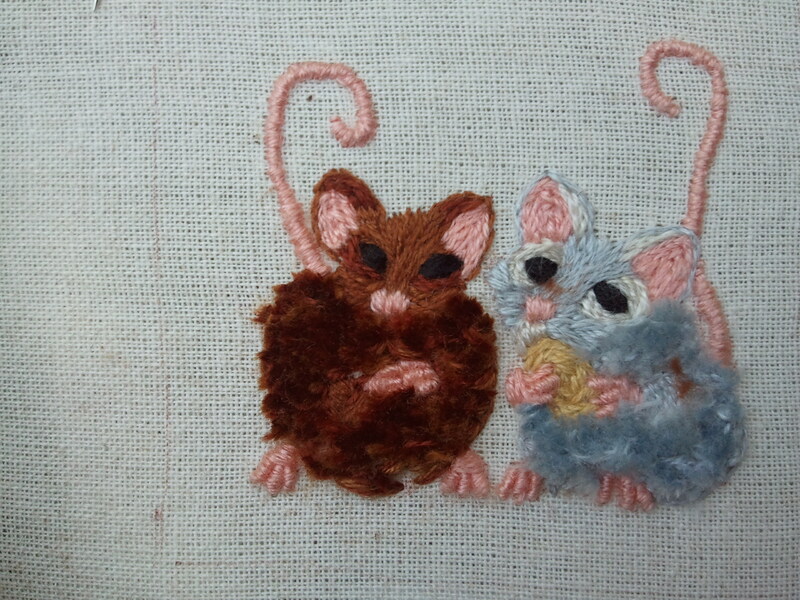 The gray mouse definitely turned out better than his poor cousin Blobby Mouse. I like them enough to try again at some point.